The 45th Community Annual Daffodil Show approved by the American Daffodil Society will be held at Bartlett’s Ocean View Farm. There are entry classes for horticulture, flower arrangements and photography. 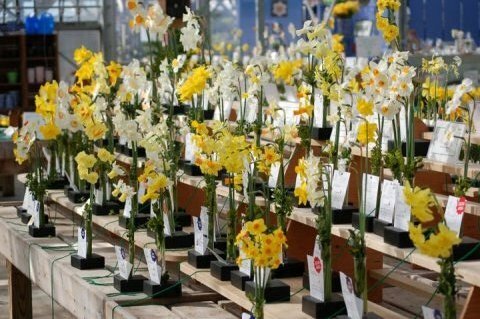 The Show is approved by the American Daffodil Society, Inc. Exhibitors may bring their entries on Friday, April 26 from noon to 6 pm and Saturday, April 27 from 7 to 9:30 am. NO late entries will be accepted. The Show closes from 9:30 am to 2 pm for judging. The Daffodil Show is open free of charge Donations are accepted for the Island’s Daffodil Planting Fund for community projects. There is a free shuttle bus from Washington St on Saturday only during show hours. From the American Daffodil Society site you can find helpful hints for exhibiting and a link to daffseek for daffodil identification. The Flower Show schedule and entry rules can be downloaded from the home page.